﻿Welcome to JHS Library Learning Commons, a place to read, think, collaborate, create, and share. It is our goal to empower the learner through a collaborative learning space with a variety or resources. 1. You must have a pass from your teacher during class. 2. Sign in upon arrival and sign out upon departure. 3. Follow all school rules. 4. Take care of library materials. 5. If you lose or damage library material, you must pay for it. 6. No food or drink in the library. 7. No cell phone usage in the library. The book club members are currently reading The 5th Wave by Rick Yancey. In addition to reading The 5th Wave, you may also join our book club and read and review the 2016-2017 South Carolina Young Adult Book Award Nominees. Post a response on the Book Club Blog Page or complete a ﻿book review﻿. We will meet monthly to discuss books and plan activities to promote reading at JHS. 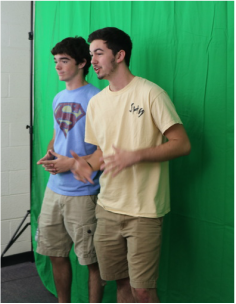 If you would like to be featured on our news show, you may submit your ideas, pictures, or photos to Mrs. Calcutt for review. If approved, you may be featured on JHS Unplugged. Please see Mrs. Calcutt or email her your ideas or photos.